We offer the finest, up-to-minute technology available in the market today and we keep a very close ear to our industry for tomorrows technology as well. You will also find that we are just as passionate about making sure your electronic systems work for you. At Digital Smart Homes you'll find a range of expertise and consulting services that guarantee unmatched technological environments - and the highest-level of satisfaction you have every right to expect. Digital Smart Homes was founded over a decade ago by Harry Saini, an electronic and technology industry expert with over 20 years of hands-on experience. Since its startup, DSH has grown to more than 35 employees and contractors across Canada. We have created turnkey audio video solutions for home owners, music enthusiasts, businesses large and small. To Listen Carefully: Because of our clients’ needs for custom solutions, we vow to listen closely in an effort to gain a full understanding of their technological needs, creative vision, and budgetary constraints. Rather than offering product and design suggestions from the beginning, we work to connect with each client and take in their inspired vision. To Offer Thoughtfully: After listening carefully, we work to offer comprehensive solutions and clearly explain what all technologies are able to accomplish. Never will our customers be scratching their heads due to lack of information or clear explanation. Additionally, we go beyond the call of duty to present clients with detailed quotes and take ample time to review all line items. We live to educate and inform our client base! To Execute Brilliantly: Once our clients have signed off on the overall concept, we “execute” the installation with perfection - all hands on deck! Home and work environments are handled with care as technologies and design elements are beautifully integrated. A key aspect of integration is full instruction on how to use all technologies, plus our team members are always available for support, even years down the road. Full Warranty Commitment: Digital Smart Homes is the only technology provider in the industry that meets all manufacturers’ warranties. In other words, most organizations offer 90-day to 1-year labour warranties; however, we have made the commitment to match our labour warranties for the same length of the manufacturers warranty of a given product. Thus, if an item comes with a 4-year warranty and fails to work properly, our dedicated team will visit your home or office, remove it, and take it in for servicing. There are no added costs for home visits or servicing that falls within the manufacturer’s warranty. We truly value our customers and strive to go the extra mile to make sure that all of our products and services make life easier and more manageable. This is our passion!! We are an Electronics System Partner you can trust. As a CEDIA Certified firm, we can offer you the finest in custom electronic design and installation. You can you be sure we know how to bring out the best in today's highly sophisticated systems for your unique and specialized needs. CEDIA certified professionals are a select group. We are proven experts who are committed to a higher standard of education. Hiring a CEDIA Certified firm will give you peace of mind—and the finest in custom electronic design and installation. The Control4 Premier Dealer designation highlights us as a custom integration dealer who specialize in automation and have achieved key training, sales and experience requirements in Control4 products. Control4 Premier Dealers are uniquely qualified to make your life Everyday Easy. Interior Designers of Canada (IDC) is the national advocacy association for the interior design profession. 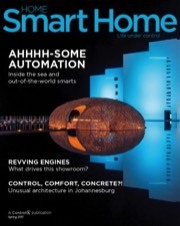 Digital Smart Homes is proud to be an Industry Member. Industry memberships help support the work of IDC, the national advocacy association, allowing them to fund programs and services for the benefit of the profession and the practitioner.